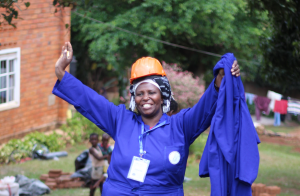 When Grace Mushongi came to the GWWI training in Kampala in Summer of 2011, she was working as a community organizer and Board Member for Bukoba Women’s Empowerment Association. Grace brings groups of women together to discuss development projects and increase women’s participation in the management of their livelihoods. Prior to the GWWI Women and Water Training, BUWEA assisted women with funding for purchase of cows, goats, pigs, and other supplies in order to maintain a method of increasing their household income, and allowing their children to attend school. When Grace returned home from the GWWI training with her partner Rachel Ndyamukama, they were able to introduce water, sanitation and hygiene (WASH) education for improved health; water testing techniques so they can identify contaminated water sources and introduce affordable ways to clean their water; and rain harvesting technologies to help women have access to water closer to their homes instead of walking upwards of 8 hours to fetch water. Since the training and with GWWI's ongoing on-site and virtual support, Grace has helped train women in her community to build 5 rainwater harvesting systems with tanks providing clean water to over 1000 people in Kasangi, Tanzania. Grace not only has the passion and the drive, she now has the solutions to bring much needed change in her community! Grace and Rachel are just one of the ten GWWI Teams who are part of GWWIs 2013 Program Women-led WASH Service Center Training, where they deepening and strengthening their capacity as WASH technicians, educators, facilitators and solutionaries! Congrats to Gemma Bulos, GWWI Director Selected as Stanford Social Entrepreneur Fellow! A huge congratulations to GWWI Director Gemma Bulos for being selected as 1 of 3 people from around the globe to be a 2013 Stanford Social Entrepreneur Fellow (SEERS Program). This highly competitive program selects social entrepreneurs working on the ground bringing innovative solutions to the world’s most pressing issues. Launched in July 2011, the program recognized the need to bring a practitioner’s perspective into the classroom at Stanford University and infuse the research agenda of Stanford’s scholars with a first-hand account of the challenges confronting the increasingly interdependent and connected world. Faculty and researchers at Stanford are eager to access the valuable experience of global practitioners whose insights into the reality of democracy and development on the ground can enrich and deepen their scholarship and theoretical work. Similarly, the creativity of these social entrepreneurs can inspire, provoke, and mobilize the immensely talented young people who study at Stanford and help them to engage even more purposefully with the world. Gemma will be mentoring students, auditing classes to strengthen GWWIs programs and teaching workshops in Social Entrepreneurship from her experience in East Africa with GWWI and in the Philippines with A Single Drop for Safe Water. 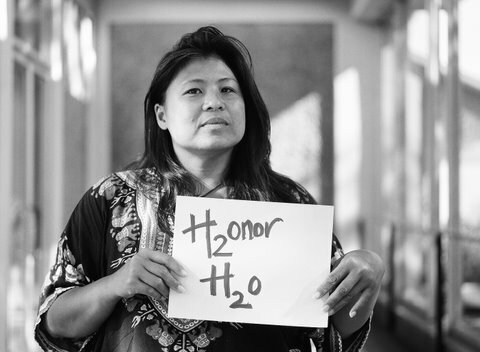 Gemma’s work in the Philippines developing an innovative approach to community driven water solutions garnered her top awards from renowned Social Entrepreneur organizations such as Echoing Green, Schwab Foundation, Ernst Young and the Tech Awards. Her breadth of experience has also been recognized by Reuters’/Alertnet where she was named one of the Top 10 Water Solutions Trailblazers in the world and by Filipina Women’s Network as one the 100 Most Influential Thought Leaders and Innovator Filipinas in the USA. Please help us celebrate this wonderful news by following us on Twitter and liking us on Facebook. Today we’d like to tell you a story about Global Women’s Water Initiative (GWWI) graduates Florence Acharit and Eunice Aliamo of Orphans and Widows Association for Development in Uganda. Because of their leadership, 200 girls at Amuria High School no longer miss classes or face violence because they have to fetch water. Remarkable transformation was possible in 2012 because YOU got involved. Because you share our posts, introduce us to your friends, host house parties, attend our Weaving the Worlds Events, join our Giving Circle and contribute financially to our work – the world is changing. If WEA raises $75,000 by this year’s end, we will launch into 2013 ready to support and unite more grassroots women leaders working tirelessly on issues of clean water, sustainable agriculture, and climate resilience. Please join us by making a donation today. We will be awarded a challenge grant of $10,000 if over 100 of you give to WEA by December 31st! 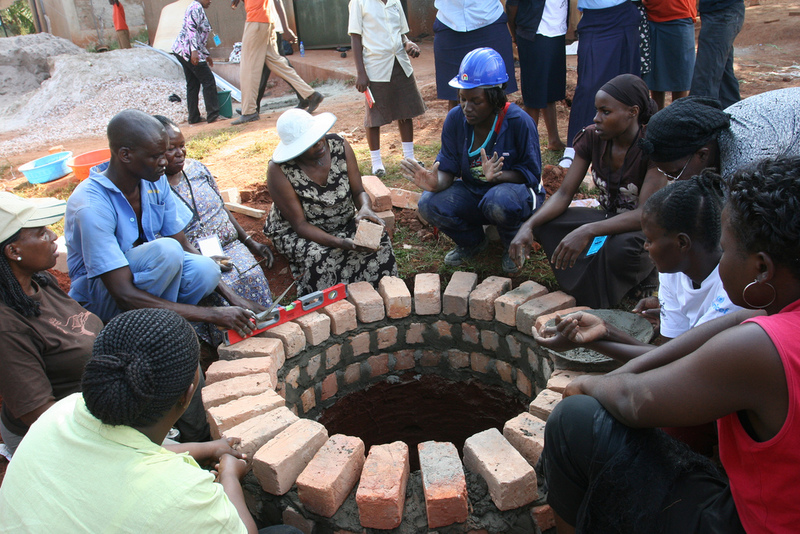 Florence and Eunice were one of 16 teams to attend the 2012 GWWI Grassroots Women and Water Training in Uganda. GWWI, our partnership with Crabgrass, has been hosting trainings since 2008. This year participants learned water and sanitation technologies, entrepreneurial tools and leadership skills. And for an entire year, GWWI provided follow-up financial, technical and peer support to the teams. So, what was it like before Florence and Eunice participated in a GWWI training? Girls had to fetch water during school, which could take 3-4 hours and put them at risk of being attacked. Girls would sometimes faint from dehydration while waiting for water or meals that were prepared late because there was no water. The school spent around $150 every week to buy clean water and cover medical expenses for students who fell ill from water-related diseases. Florence and Eunice applied their skills to build two 15,000 gallon tanks to catch rainwater in a primary school and high school in Amuria, Uganda. Now, the girls have safe water to drink. Money that their school once spent on water and medicine will go towards a well that will that serve the entire community for years to come. 2012 is full of stories of bold women leaders like Florence and Eunice protecting the earth and redefining our future. The grassroots women and groups WEA partnered with this year brought 15,000 people access to clean water and trained 2,400 women farmers in sustainable agriculture and native seed saving practices, along with climate change awareness programs. 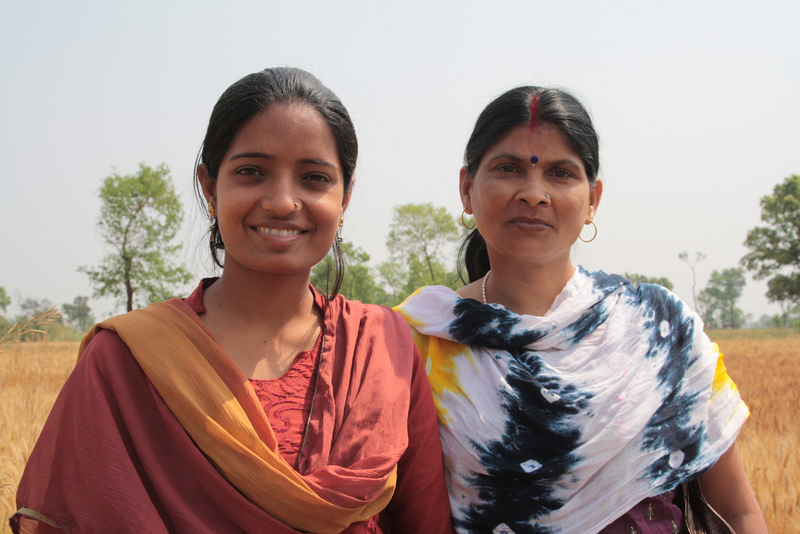 From East Africa to India to California, we supported women leaders to share water and sanitation practices, develop strategies to adapt to a changing climate, and build relationships critical for creating change. 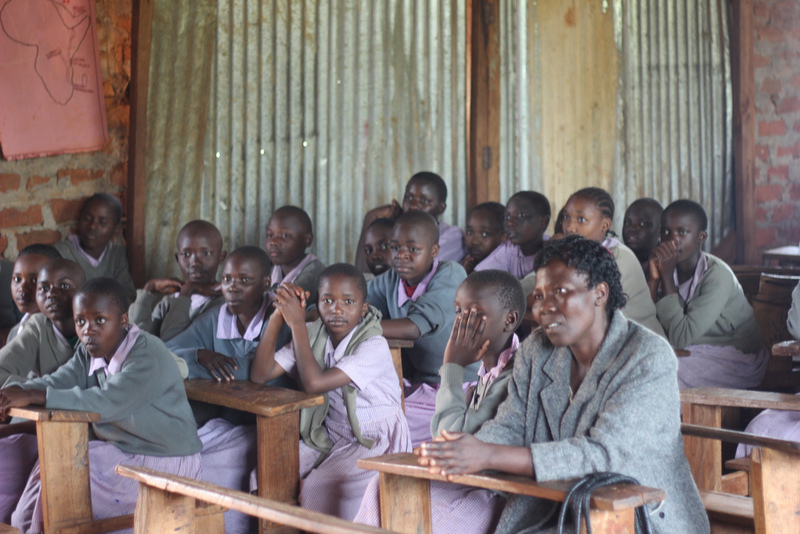 Read more about our 2012 Impact. 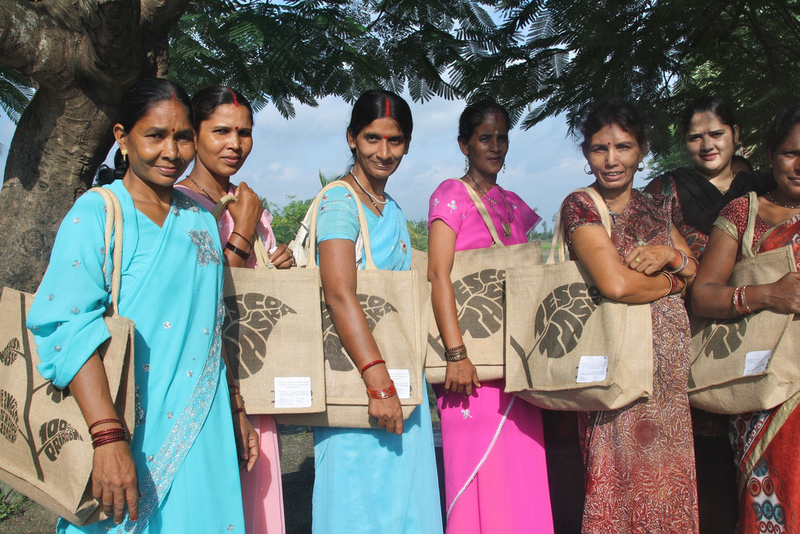 The India Program will expand its support to South Asia with the launch of a small grants initiative for indigenous and rural women’s groups working to promote human rights, traditional knowledge, sustainable agriculture, and environmental justice. GWWI will launch the WASH Service Center Training Program for graduates of Women and Water Trainings to deepen their knowledge of sustainable water, sanitation and hygiene strategies, and become professional implementers, trainers and social entrepreneurs. The North America Program will continue to coordinate legal advocacy support in partnership with North American Indigenous women leading environmental justice campaigns. We are reminded by the collective efforts of grassroots women that resilience – the ability to rise up stronger from a difficult situation – is possible when we stand together. The more we unite, the greater strength we have to persevere against all odds. When you donate to WEA, you stand with a global network of women leaders moving together towards resilience in the New Year and beyond. Please give today and be 1 of the 100 donors who make our challenge grant and $75,00 goal possible. P.S. If you are still shopping for Holiday gifts, you can make a donation to WEA’s work in honor of your loved ones and we’ll send them a beautiful, personalized card! After a stellar year where GWWI graduates provided clean water and sanitation to over 15,000 people, GWWI launches its next phase of training. 10 of the strongest teams (20 women) who graduated from our Women and Water Training in 2012 were selected to participate in this inaugural training program. They came to deepen their knowledge in WASH strategies so they could build Women-Led WASH (water, sanitation and hygiene) Service Centers that can provide a variety of WASH services to meet the many different needs of their communities. When we look at local water and sanitation needs, often communities don’t have just one issue that they are dealing with. Water access, water quality, sanitation/toilets, proper hygiene practices and water source protection are among the main problems that the communities must address. For example, just being able to provide a water filter when people don’t have proper hygiene practices – the community is still at risk of getting sick. Also, just having a water tank but no toilet and open defection is practiced, again, there are health issues at stake. Being able to provide different technologies and comprehensive hygiene education in a holistic way is the best way greatly reduce the risk of water related disease in a community. The 10 teams that were selected to participate were able to meet their year long goals and in many cases, exceed them. The three-phase training program will be offering technologies and strategies that will cover the following WASH challenges: 1) Water Access, 2) Sanitation and 3) Water Quality. At the end of November 2012, the teams gathered for the first of the three trainings to learn to build rainwater harvesting tanks with interlocking stabilized soil brick water storage tanks. Those who had learned to build this technology last year and were able to build at least 2 tanks in their communities had an opportunity to mentor the teams who had learned another technology. This provided opportunities for experienced RWH/ISSB implementers to deepen their knowledge by coaching and allowed the new implementers to learn from their colleagues. In addition to the technology training, all the teams were introduced to Participatory Integrated Community Development – an engagement methodology that helps communities to identify their own water issues and select the strategy and technology that they want to implement. They also began to design a WASH Advocacy plan that will help them build local WASH campaigns to change attitudes and behavior to ensure that proper WASH habits are being practiced community-wide. At the end of this 18 month training program, these teams will have a menu of WASH services to offer their communities which will build their expertise and raise their voices in a sector where they are often not included.